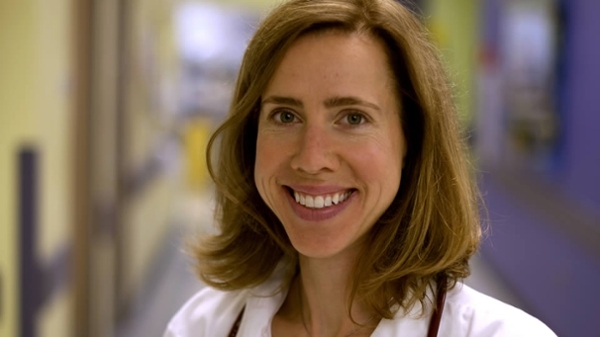 Miriam Vos, MD, MPH, is an assistant professor of pediatrics in the Emory University School of Medicine, and pediatric hepatologist at Children’s Healthcare of Atlanta. She specializes in the treatment of gastrointestinal disease in children as well as fatty liver disease and obesity. Several of her clinical studies on nonalcoholic fatty liver disease (NAFLD) use the Atlanta Clinical & Translational Science Institute’s (ACTSI) clinical research site at Emory University Hospital. Vos seeks to understand whether the low-tech intervention of diet alteration could be effective in combatting NAFLD. “While previous research shows correlational data on sugar’s link to nonalcoholic fatty liver disease, there are no studies demonstrating that sugar is sufficient to drive improvement in the disease,” said Vos. This study is necessary to provide the best nutritional recommendations to the millions of children with NAFLD in the United States and to discover appropriate diagnostic and therapeutic approaches. The clinical trial, involving 40 boys with NAFLD age 11 to 16, provides families with a similar version of their daily diet, with the exception of free sugars, those “refined,” either by humans or by animals (like honey). Absolutely no sweets are allowed, not even those with artificial sweeteners (fruit is allowed). The control group will eat and drink their normal diet for the eight-week period. By identifying the specific dietary triggers of NAFLD, knowledge can be gained that is necessary to improve the lives of the millions of children and adults who currently have the disease and to prevent others from developing it. Beginning this fall, the study will measure outcomes by the percentage of fat in the liver measured by MRI. Vos is also finishing a pilot study titled, Study of Losartan in the Treatment of NAFLD in Children in ACTSI’s Pediatric Clinical Research Unit at Egleston. This study explores the effects of Losartan, a common and inexpensive blood pressure medication, and its positive effects in children with NAFLD. ACTSI is a city-wide partnership between Emory, MSM, and Georgia Tech and is one of 62 in a national consortium striving to improve the way biomedical research is conducted across the country. The consortium, funded through the National Center for Advancing Translational Sciences (NCATS) and the National Institutes of Health’s Clinical and Translational Science Awards, shares a common vision to translate laboratory discoveries into treatments for patients, engage communities in clinical research efforts, and train the next generation of clinical investigators.